Our goal is to make a positive impact on society by developing future leaders through undergrad, MBA & PhD degree programs, & tailored non-degree courses. We feature an innovative curriculum, an intimate community & world-class faculty. This powerful combination produces outstanding personal and professional results & places us among the world's leading institutions. From stellar employment rates to distinctive leadership development opportunities to a worldwide network of alumni--students leave Emory with limitless benefits, including confidence in their ability to impact the business world. Applicants to the Goizueta MBA program must submit the following materials: a completed online application; official transcripts for all undergraduate and graduate schools attended; an official GMAT score report; and two letters of recommendation (the first is a narrative resume; the second offers a choice of subjects that center on your sources of...Applicants to the Goizueta MBA program must submit the following materials: a completed online application; official transcripts for all undergraduate and graduate schools attended; an official GMAT score report; and two letters of recommendation (the first is a narrative resume; the second offers a choice of subjects that center on your sources of inspiration or your career and life aspirations). An interview, while not required, is "strongly recommended." International students whose first language is not English must also submit official score reports for the TOEFL, PTE, or IELTS. Candidates for the one-year program must have an undergraduate degree in a business-related discipline or a strong quantitative background and "solid business experience." Student perspective on the Goizueta Career Management Center is mixed. “Career serv­ices could use some love,” is how one student puts it. “No one seems to be able to pin­point what exactly goes wrong there, but in general people seem less than satisfied with their help. Placement seems to be good, though, so something is working.” Several voiced the feeling that the office “struggles with attracting large companies to recruit here. Despite our name, we are not a feeder school for Coke nor do we see much of the other major companies in the Atlanta area. On the other hand, we have many alumni at all those companies who through the power of networking are happy to help students find jobs and placements.” Despite the fact that many Atlanta companies have been on a hiring freeze in recent years, over 150 companies have visited Goizueta for on-campus recruitment. Employers who most frequently hire Emory MBAs include: Accenture, AT Kearney, AT&T, Bank of America, Citigroup, Chevron, Delta Air Lines, Ernst & Young, General Electric, Georgia-Pacific, Humana, IBM, JP Morgan, Kimberly-Clark Corporation, Kurt Salmon Associates, PricewaterhouseCoopers, SunTrust, The Coca-Cola Company, and Wipro. 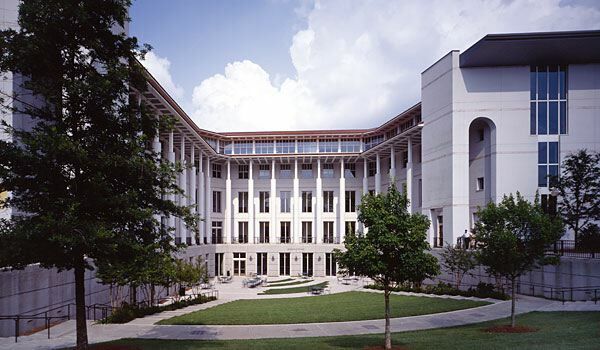 “The community is the greatest strength” of the Goizueta Business School at Emory, where “there are 200 other [students] happy to help with any project or connect [you] to their network.” And it’s not just the student body that personifies the “culture of collab­oration over severe competition” that presides here. “The community outside the current students is also phenomenal,” we’re told. “Alumni are happy to mentor, connect you to networks, and help you find directed study [opportunities], jobs, or internships.”Collaboration is encouraged in part through Goizueta’s “lack of a hard-lined grading system” (grades are evaluative and do not correspond to GPA). It “definitely helps the community atmosphere,” although students “still feel pressured to do well personally.” The size of the program also helps; “the smaller school size makes Goizueta thrive on the ambition, creativity and curiosity of its students,” one student writes.Given the communal vibe, some might find it ironic that Goizueta’s primary curricular emphasis is leadership. Regardless, the school offers “wonderful leadership courses with guest speakers and applied learning.” It’s all part of a “flexible” curriculum to which “new and relevant courses are frequently added (e.g., e-marketing, globalization, and illiquid assets in times of financial crisis),” and which provides ample opportunities for students to pursue their unique interests through electives. As one MBA student explains, “Emory’s curriculum is very customizable, which comes from having a small class size.”Despite the laid-back atmosphere, academics are demanding at Goizueta. As one student puts it, “you genuinely need to push yourself hard and are challenged to reach the top of any class, but the focus is on really internalizing and learning the basics and founda­tions well. It’s not an insanely competitive environment; it’s one where you can truly learn and if you want to excel with grades and recognition, you can without feeling as though such things [are] easy or commonplace.” Goizueta’s location in Atlanta, a major metropolis home to many Fortune 500 companies, provides plenty of networking oppor­tunities and a steady stream of well-connected professors and guest lecturers. Faculty members “are leaders in their fields, passionate about the material, and very accessible.” “Every one of them brings great work experience as well as academic credentials to the classroom. They are willing to bring in current business-related events into the classroom and are eager for students to bring in their work experience into class discussions,” stu­dents tell us. Australia, Chile, China, Costa Rica, Finland, France, Germany, Korea, Mexico, The Netherlands, Singapore, South Africa, Spain, Venezula, United Kingdom. C. Scott Mayfield, EMBA '86 - President, Mayfield Dairy Farms, Inc.
Charles Jenkins Jr., BBA '64, MBA '65 - CEO, Publix Super Markets, Inc.
Want more info about Emory University, Goizueta Business School Part Time MBA? Get free advice from education experts and Noodle community members. What sort of balance is offered completing a Part Time MBA at Emory University’s Goizueta Business School?